Using the 12.7mm (.50cal) round in the M107, AS50, and KSVK, in addition to the .338 Lapua Magnum cartridge of the British L115, you can reach well past 1200 meters. Ballistics is what gives the edge to these rifles when engaging at long-range, and what makes you a sniper versus just another boot-on-the-ground. You can employ the standard holdover method using even the thick black lines or “posts” to get the necessary point of aim. If you look at the image, notice the red dots projected over the bottom post of the mil-dot reticle. 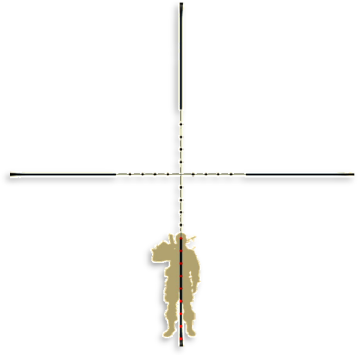 The sniper must imagine mil-dots, ticks, or chevrons traveling down the length of the center post, depending on the reticle type. Learn about the different reticle types in our Using a Sniper Scope post. Now you have a method enabling you to engage targets out to 1800m or further. You can’t see those extra mil-dots, so it is a bit of a guessing game. SWAG anyone? When you engage targets like this, you can judge the extra references, but it takes some practice making this repeatable because you can’t actually see them. A player with good eyesight, a strong ability to mentally visualize objects, and able to recall and adjust muscle memory can normalize this feat. This technique holds true for any sniper weapon system where you want to gain extra range. It can, and should only be done, when you can afford to dispense the extra ammo and the mission parameters make it fine to spook the entire area around your target as your shots are lobbed in. Your part in making the enemy take cover could prove to be a worthy distraction as your friendly forces move in close for the finish. However, if you’ll end up spending the majority of the time trying to hit moving targets while handicapped with a 2 second time to target, you’re not doing your team any favors.